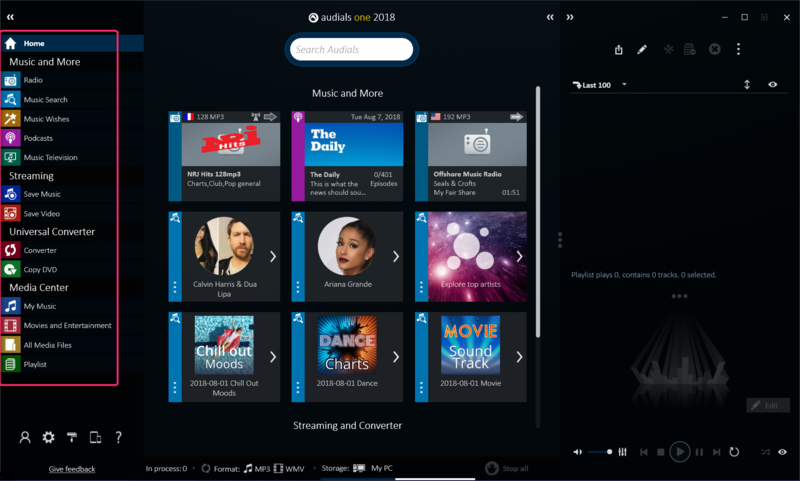 If you like listening to radio stations, web-based streaming or music TV, Audials one 2018 is the all-in-one media software that lets you search, stream, download, record, convert and organize any media files in easy and professional way. It offers massive, fast, legal and free supply of music! Only Audials One searches the best music sites and simultaneously monitors thousands of radio stations throughout the world. This is done through Audials Radio Network. You will be provided with the music you want lightning-fast! You get the charts, singles, albums or the complete discographies of your favorite stars only with the turbo from Audials One. Just enter the genre, artist, album/sampler name or title and Audials legally delivers music from Internet radio stations or via straight search on websites, social news from Facebook and Twitter for radio stations and played artists. =Record Music Streams: Audials can record any audio from music streaming services or websites right from your browser and save them in any desired format. High-Speed recording for music. Recorder for recording video streams of movies, series, documentaries and sporting events. Record any movie from online video libraries, video portals, pay services and hit series from media centers and save them in the right format for any playback device. Commercial blocker to avoid annoying commercials. Auto-tagging for all possible information on movies. Higher streaming quality with the right FPS setting for video recordings. Improved video collection display with switchable viewing modes. =Mini-window: informs with additional notifications about the best method to use for each source, giving therefore absolute control while recording. =Format Converter for Music, Audiobooks, Videos, Movies & DVDs: Free or protected music, audiobooks, videos & movies can be optimally converted into 85 file formats for PCs, notebooks, netbooks, smartphones, tablets and game console. Advanced converting settings with access to individual profiles and expert mode with 1000 possible combinations. Player, recorder, media manager, cloud manager, ID3 tagger, DVD & CD recorder, audio editor. Excellent software for recording and converting multimedia. Audials one 2018 is thebest and ideal software which can search, download, record, convert and organize media files from music sites and network around the world.